It had been so many generations since the mage-lights were last seen that they'd become the stuff of legend. But for seventeen-year-old Jenna Aoire legend became reality one night on Knobtop Hill when she found the stone--not much more than a large pebble yet there was something about it that drew her. And then the mage-lights filled the sky, bringing trouble and magic with them that would irrevocably alter Jenna's life. S. L. Farrell boasts (but generally resists sending out) a resume that includes the obligatory long list of occupations, including a stint as half of a juggling act where a few scars and a grudging appreciation for gravity were acquired. Other interests include music, fine art, history, and the fascinating details of cultures both present and past. 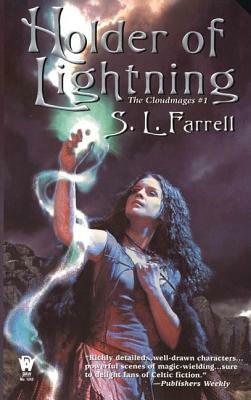 S. L. is the author of The Cloudmages trilogy: Holder of Lightning, Mage of Clouds, and Heir of Stone; and The Nessantico Cycle: A Magic of Twilight, A Magic of Nightfall, and A Magic of Dawn. S. L. Farrell currently lives in Ohio and teaches Creative Writing at a local university. He can be found at farrellworlds.com.